Entertainment at wineries and vineyards requires a unique set of skills that THEY improv has developed over years of successful events. We have a variety of options to fit most any group. With both improv comedy and stand-up comedy options, we can provide a different amount of interaction. Game shows are fun Emceed events that hold the promise of prizes and teamwork. 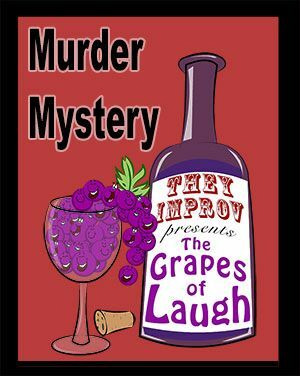 Murder mysteries can be provided by actors or can focus on your people playing characters for team building. From the California Vineyards of Sonoma County and Napa Valley, to the wineries of upstate new York, we understand the needs for wineries to entertain their guests while maintaining the atmosphere of the venue. Simply contact us to find out how The Grapes of Laugh can come to your venue.